The UK Independence Party (UKIP), the country’s only official pro-Brexit major party, has created what has to be one of the most bizarre campaigning videos of all time. 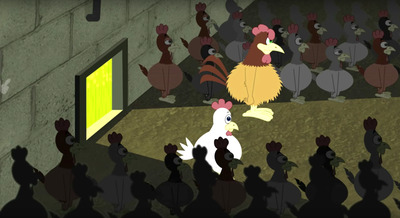 The two-minute long cartoon clip titled “We’re Better Off Out” uses a chicken farm to represent the EU and hundreds of chickens to represent the British population. The farm is dark, overcrowded, and overseen by a man whose face we never see — presumably symbolising what the Brexiteers call “unaccountable” EU officials. One of the chickens decides to leave the farm and goes outside, where everything is green, the sun is shining and there’s enough space to roam freely. After some persuasion, the other chickens follow its lead. The clip has been released just a few days after the party’s leader Nigel Farage caused outrage after standing in front of a poster which said “BREAKING POINT” and showed a picture of hundreds of refugees walking in a field.